Staying in the Havana cabins aboard the Carnival Horizon may not be cheap, but boy-oh-boy is it nice. For my Havana Experience, I selected cabin 5217… which was also the only Havana cabin left available when I decided to book one. Entrance to the Havana Suites on Carnival Horizon. Carnival first introduced this area, an extension to its well-known Havana Bar, on the Vista. The aft-facing area consists of an outdoor bar, pool, two hot tubs and a variety of comfortable seating options. Havana Retreat on Carnival Horizon. Pool in the Havana Retreat on Carnival Horizon. What makes this area special is the fact that during the daytime, the Havana Retreat is available exclusively to those who book staterooms in the Havana area. Only after 7 p.m. are non-Havana guests permitted to access the area. Access to the Havana Retreat is monitored before 7 pm. What this exclusive access means is no fighting for a lounge chair, no lines at the bar and no children hogging the pools, as all occupants of the Havana staterooms must be at least 12 years old which means, by extension, that those are the youngest guests you’ll find in the Havana Retreat. Havana Passengers will be given a branded silicone wristband which grants them access to the area during the day. They’ll also find Havana pool towels in their stateroom that are tan instead of blue to help identify them as belonging to Havana passengers. A crew member is posted outside the entrance to the area to turn away anyone who is not a Havana guest. There are a variety of cabin categories available within the Havana area, which means that you do not have to pony up for a suite (or even a balcony) to get access to the private sun deck. There are interior, balcony, aft-view extended balcony, premium balcony, premium vista balcony and suite staterooms within the Havana area, which is separated from the rest of the ship and requires a keycard to gain access. The different categories of Havana staterooms. Most of the Havana cabins are located on Deck 5 (which, conveniently enough, is also where the Havana Bar and Retreat are found), although there are several on other decks. Also, all of the aft-facing balconies — which overlook the Retreat — are Havana staterooms as well. (Obviously, some of the staterooms which are classified as Havana are outside of the area which requires a special keycard to access.) The cabins have decor that is meant to feel like you’re visiting Havana, Cuba, and are stocked with several special soaps and lotions that the regular rooms don’t have. 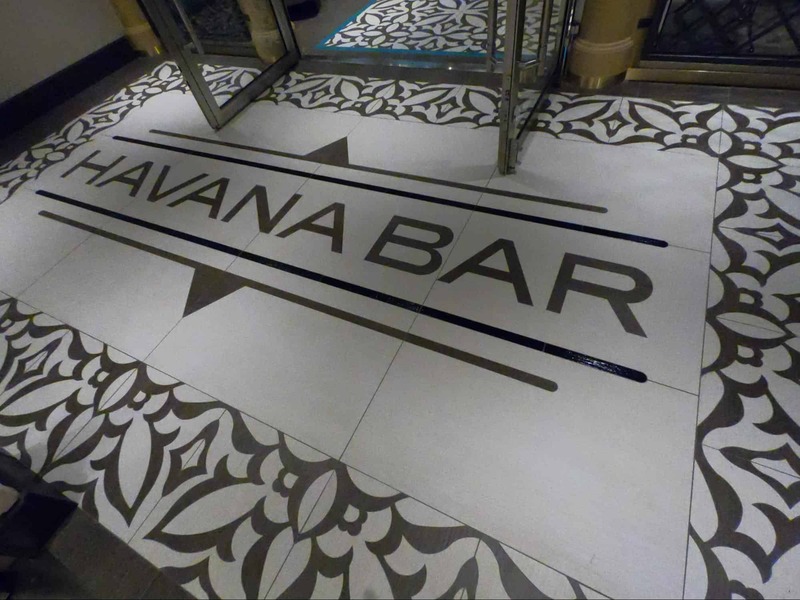 The hallways are also designed to have a Havana feel, again setting the area apart from the rest of the ship’s decor. Interior cabin in the Havana stateroom area. What is very unique about the balcony and suite rooms (dubbed “cabanas”) on deck 5 is that instead of a traditional balcony, they have a patio that borders the deck. Outside lanai cabins in Havana area. This means that people can walk right up to your “balcony” and start talking to you… but past cruisers have reported that there is no issue with foot traffic. (Again, only those with access to the area would be able to walk along this particular stretch of deck.) Privacy inside the room is also not a concern, as the windows and balcony door is mirrored glass. The cabana patios are deeper than a standard balcony, and are furnished with a small table, a regular chair, a lounge chair, and a swing chair. For my stay in a Havana cabin, I chose an interior room. While I wanted access to the private sun deck, I thought, “Why would we need a balcony if we have the whole Havana Retreat area to ourselves?” And that was definitely the case most of the time. Even on our sold-out sailing, we rarely saw anyone else out enjoying the Havana Retreat when we were. The Havana interior rooms are among the most expensive interior rooms (on a per-day average basis) that you’ll find on a cruise ship. But they are far less expensive than the stateroom options you’ll find on other cruise lines which offer exclusive ship-within-a-ship private areas, mostly because they do not offer interior cabins. That said, I do think the cabana/balcony rooms are really cool, and might save up to try one out one day… but then I would have to stop cruising so often. This was my first experience in an interior room, having only stayed in balcony rooms previously, but the two of us felt like we had plenty of space for ourselves and everything we brought along for the two-week voyage. There’s no better excuse for eating your room service-delivered food in bed than not having a couch and coffee table. Our transatlantic sailing was at the beginning of May, which meant that it was not all that warm on several days. But we did make a point to hit the hot tubs in the Havana Retreat at least once a day. The hot tubs are huge… to the point that it almost doesn’t seem fair that the hot tubs for a mere 100-200 guests are quite a bit larger than the ones elsewhere on the ship which have to be shared by thousands of passengers. But they are larger, and they feel so luxurious! Loungers line the deck of the Havana Retreat. The pool is smaller than the main pools on the Lido deck, but there is rarely anyone using it. Due to the lack of warm, sunny days, we didn’t do much more than stick our toes in the pool. Havana Retreat pool located on deck 5 aft. There is plenty of seating, especially since — between the passengers with balconies and all of the activities keeping people busy throughout the day — I would be shocked to see the sun deck full. We didn’t use the chairs a lot, but took our lunch outside with us a few times to enjoy the sun and amazing views of the ocean, stretching behind us as far as the eye could see. The outside section of the Havana Bar faces the retreat. This wasn’t my favorite bar. There was only one bartender at any given time, even though the Havana Bar has both an indoor and outdoor area. Somehow, I had to wait forever every time I went there, even when there was only one person ahead of me. It was nice that there weren’t lines, but I think the bartender took that to mean he could take his sweet time. I suppose that on a sailing with a high number of 20- and- 30-somethings on board, this slower pace would be a huge relief from the lines found at the bars on the Lido deck. After a couple of longer-than they should-be visits to the Havana Bar for a drink, I found that I was better off going to the Plaza Bar for my drinks. I suspect that after 7 p.m., when the area opens to all of the passengers on board, they have more bartenders working, but I didn’t manage to visit the Havana Bar after about 5 p.m. during our trip. Another perk of being in the Havana cabins is their proximity to the breakfast served at Ocean Plaza. The breakfast is not exclusive to Havana guests, but it is much more convenient than going up five floors to the Lido Marketplace. The spread is not quite as extensive as you’ll find at the buffet, but you will find many of the same offerings minus the crowds. We ate breakfast there every day except when the Sea Day Brunch was offered. Are The Havana Staterooms Noisy? One of the questions you hear people asking often is whether you can hear the music from the Havana Bar in the stateroom when you’re trying to sleep. I can’t say for certain that was what I was hearing, but some nights, I was kept awake by nearby music. There were several nights when I think what we were hearing might have been coming from the Lighlight Lounge on the deck below (although not directly below) our stateroom, given that when it morphs into a nightclub, they really crank up the music. Emma Jude performs in Ocean Plaza on Carnival Horizon. The music may also have been coming from somewhere else on the ship, as there are a lot of bands playing around the ship at various spots. Having one of the cabana staterooms would likely alleviate the noise since they don’t share walls with the Havana Bar, and are farther from the other noisy spots. If I had a choice, I would have picked one of the few interior rooms on deck 6 and 7 but those were long gone by the time I booked my cruise. But I knew we would likely be staying up later than the bands play most nights, so it was only an issue on the days that we were tired and hit the hay before midnight. Entrance to the Havana Bar. I would not recommend an interior Havana cabin for anyone who wants to go to bed early and is a light sleeper. I was glad that I wasn’t any closer to the Havana band, but I think it’s unlikely that being two or three rooms closer would have made much difference. If you can afford to stay in the Havana area, it’s definitely worth it. It’s really nice having the private area, and I personally loved the location on the ship. In some stateroom categories on certain sailings, you can get a Havana stateroom for only around $300 more than you’d pay for a regular stateroom That’s a small enough price difference that I could easily talk myself into the upgrade every time. If booking a Havana cabin maxes out your vacation budget, don’t do it. It was wonderful, but not worth sacrificing other things you might want to do on your trip. I wish the upcharge was not so high, but I have yet to come across a Vista or Horizon sailing for which the added cost is low enough to splurge again. What it really comes down to is how much value you put on having access to the Havana Retreat and its private amenities. Want to read more from our special guest columnist Lauren Rodgers? Visit her blog, Lauren of All Trades.